ZENNER PMNR Reclaimed Water Metersutilize a magnetically driven multi-jet design. They are de-signed to measure non-potable cold water where flow is in one direction only in residential, commercial, and industrial settings. OPERATION: Water flows through the meter’s strainer andinto the measuring chamber where it drives the impeller. A drive magnet transmits the motion of the impeller to a driven magnet located within the hermetically sealed register. Power-ful rare earth magnets eliminate slipping and uncoupling to in-crease overall accuracy. The magnet is connected to a gear train which translates the impeller’s rotation into volume totali-zation displayed on the register dial face. 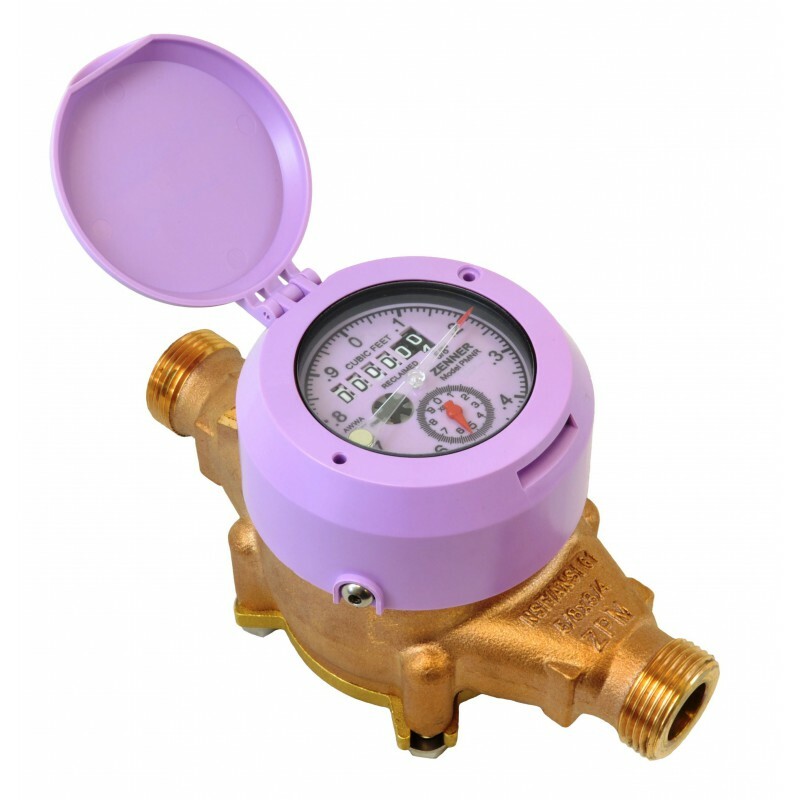 CONSTRUCTION: ZENNER PMNR Reclaimed Water Meters consist of three basic components: main case,measuring chamber and sealed register. The main cases are constructed using either C89833 or C89850 Brass Alloys. Measuring Chambers are constructed of a durable synthetic polymer. Registers are available as either direct read or electronic output. MAINTENANCE: ZENNER PMNR Reclaimed Water Meters are engineered and manufactured to provide long-term service and operate virtually maintenance free. The precise simple design allows for interchangeable parts, reducing parts inventory. REGISTRATION: ZENNER PMNR Reclaimed Water Meters utilize a magnetically driven, hermetically sealeddesign. The sealed design eliminates dirt, moisture infiltration, and prevents fogging. The register includes a large odometer-type totalization display, center sweep hand (360°) test circle, low flow leak detector. All ZENNER Meters have electronic output capabilities for easy conversion to Automated Meter Reading. 5/8” through 1” capacities are: 10,000,000 Gallons, 1,000,000 Cubic Feet, 100,000 Cubic Meters, 6 odometer wheels. 1-1/2” and 2” registration capacities are: 100,000,000 Gallons, 10,000,000 Cubic Feet, 1,000,000 Cubic Meters, 6 odometer wheels. 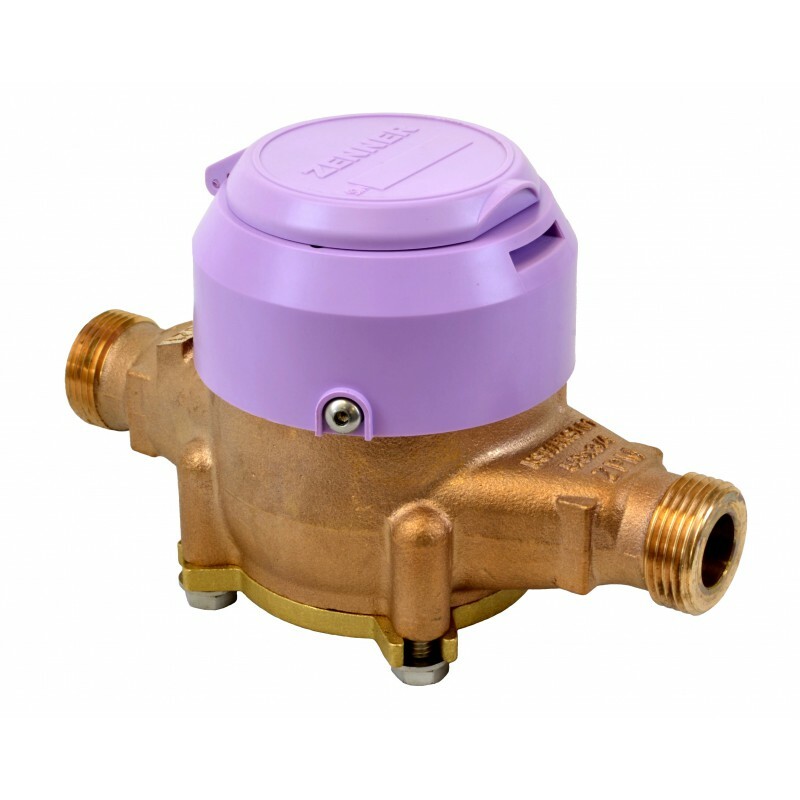 CONFORMANCE: ZENNER PMNR Reclaimed Water Meters are tested and comply with AWWA C708, ISO 4064,and G13IT19001-ISO9000 performance standards. These Meters comply with the lead-free provisions of the SafeDrinking Water Act and are certified to NSF/ANSI Standards 61 and 372. CONNECTIONS: These meters have been designed with ease of installation in mind through the use of wrenchpads. Tailpiece/Unions for installations of meters are available as an option for various pipe types, sizes, and misaligned pipes.